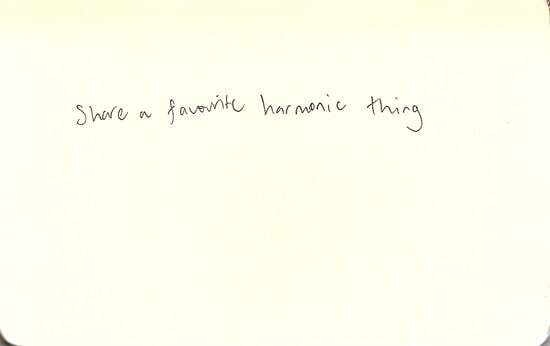 Share a favourite harmonic moment. I guess this could either be a chord change, or a bunch of chords. Or the sound of a chord, maybe. Often with a beautiful harmonic moment, it’s the accumulation of things that lead up to a harmonic shift. It might involve preparation, anticipation, surprise, modulation. All kinds of good stuff. One of my favourite harmonic moments happens at the end of Chopin’s Prelude in E minor. It’s at 1:30 – 1:32 ish on this recording. Stomach crunching. It will make you want to curl up into a ball. If you have Spotify, then you can share a nice harmonic thing by adding a track to this collaborative playlist, as well as checking out whatever else anyone adds. Be sure to point out what it is that’s so delightful to you in this here comment box.